Oreoluwa holds a Bachelor of Arts degree in History and Strategic Studies from the University of Lagos, (2012). During the National Youth Service Corps (NYSC) programme in 2013, she served at the Enugu State Ministry of Local Government Matters where she carried out administrative duties and provided staff-inquirer interface. 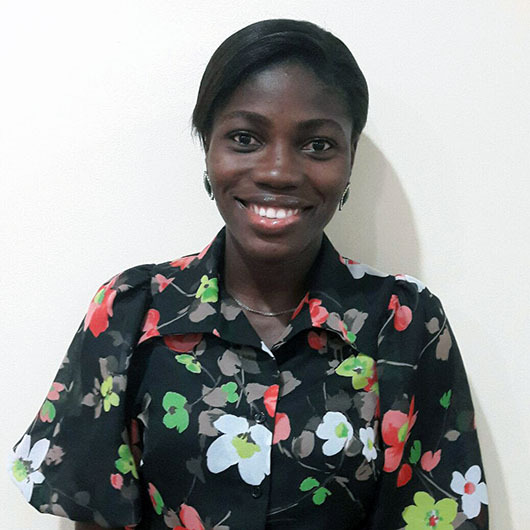 Prior to joining CMRG, she worked at Mollyfield School, Somolu, Lagos as the School Administrator. She assisted in administration matters, event organizing and execution, teacher development training programme and marketing during her stay in the school. She joined Communication and Marketing Research Group Limited in July 2014 as a Front desk officer and she started her research career at the company where she participated in Coding and Back-checking. In 2015, she became a Trainee Research Executive and has been involved in preparing research tools and carrying out research work for CMRG’s client. She was exposed to in-house comprehensive training on Marketing Research and also attended a 3-day Workshop on Marketing Research in August 2015; a training organized by NIMRA. Her current position is Research Executive.